WFP provided school meals to nearly 250,000 children in preschools and schools in Lesotho in 2014 while 190,000 children received two meals a day at school through a Government-led programme. WFP is helping the Government to take control of the national programme by 2018.
International School Meals Day on 5 March recognizes the vital role that school meals play in fighting hunger and promoting children’s development. Five-year-old Kamohelo Malikhetle is in her final year at the Thuto-Ke-Leseli Preschool in Lesotho and she’s already thinking big. She wants to be a nurse when she grows up and is excited about starting primary school next year. 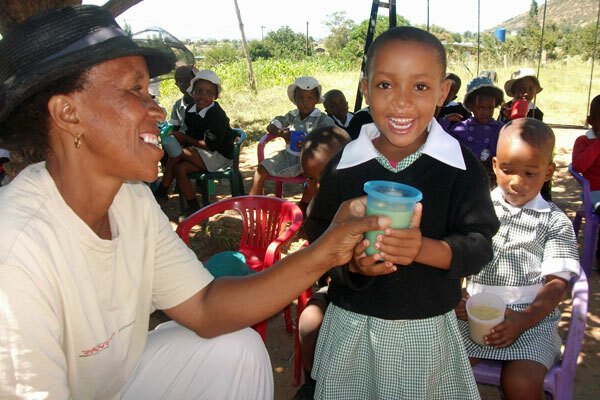 “I am happy that I will be going to a big school next year,” Kamohelo says as she sips a cup of porridge. For the past two years Kamohelo has enjoyed her classes, playtime with her friends and the two meals she has received every day through WFP’s school meals programme. Thuto-Ke-Leseli, which means “education is light”, is located in Ha-Mohasoa village and is one of many rural preparatory schools outside the capital Maseru on the South African border. Here children learn, play and eat together – developing their minds and bodies in preparation for the next stage of their education. The preschoolers receive morning porridge and a lunchtime meal to improve their stamina and learning capacity. With the provision of food, the class keeps growing. But Maramoqhotsane Masoetsa says working with children is her passion. 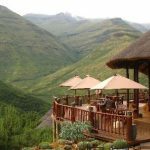 Food insecurity is high in Lesotho affecting more than 500,000 people or nearly one quarter of the population. Chronic malnutrition is widespread and 39% of children under age five suffer from poor growth known as stunting (Matope; 2015). At this preschool more than half the children do not have enough to eat at home. Attending class is not only about furthering their education, it’s a sure way to escape hunger. Although each child is expected to pay M250 (around US$ 20) per term, many families are so poor they cannot afford the school fees (Matope; 2015). WFP’s school meals programme is designed to address micronutrient deficiencies in the children’s diet, promote their development and encourage parents to keep their children in preschool until they are ready to begin their primary education. This year WFP will provide 50,000 children in 2,000 preschools throughout the country with a mix of super cereal porridge, beans, vegetable oil and maize-meal. WFP is also building kitchens and storerooms for schools in five districts (Matope; 2015). Good nutrition helps to improve student attentiveness inside the classroom while providing a safety net for the children and their families (Matope; 2015). . Sister Alexius Mohanoe is the manager of the St Ambrose Day and Boarding Preschool in Ha-Masana village in rural Maseru. The school has 48 children and Sister Alexius says WFP’s food assistance is essential for improving their health and nutrition (Matope; 2015). The food is nutritious, our children are healthy and they like it.